Three years ago I started reading about linen bed sheets. Ironically, this was the time when I began selling off high-quality Sferra king-size cotton sheet sets on eBay with the aim of reducing the contents of my linen closet. For many years we had two homes and over time I acquired 17 sets of sheets for our king-size bed! Yet linen sheets were a trending novelty on home design blogs at the time. Talk about obsessed. I kept reading and quickly became fascinated by the idea of trying out a set of linen sheets. I felt they would be similar to the half-cotton/half-linen métis sheets I loved when I lived in France. Then, my friend Alex (a.k.a. Alex the Enabler) bought a high-end set from Rough Linen, a favored California internet retailer founded by British-born Tricia Rose, who initially began sewing sheets to order at home in San Francisco. Alex liked linen better than cotton because he sleeps hot and found them cooler and less sticky. He also enlisted my opinions while researching his purchases since I had recently completed my comprehensive post on buying cotton sheets. My 2015 cotton sheet post, Making Sense of Buying Bed Sheets, debunks thread-count marketing, exposes the lack of legal standards for labeling, and gives guidelines for smart buying. My aim now is to present information about linen bed sheets to help inform buyers. I have not tested brands of sheets against each other nor do I feel it’s useful to do so. There are far too many variables, needs, tastes and budgets. In buying three sets of linen sheets I learned that there was even less information about linen than cotton bedding. Offerings have multiplied rapidly along with claims that linen sheets are healthier than cotton (no proof), that they will last a lifetime (that depends), and that thread count is a factor (wrong, wrong, wrong). Because America has, historically, been a cotton-growing nation it is natural that our default bed-linen fiber has been cotton. Until the late 1980s we also manufactured cotton sheeting (including my beloved Wamsutta percale sheets). In contrast, Western Europe and Baltic countries continue to be flax-growing and linen-manufacturing nations that export quality linen textiles. However, among the 25 different sources for linen bed sheets included here, are linen sheets of European and Chinese origin and manufacture as well as sheets made of imported linen but handmade in the U.S. The current costs of linen sheet sets can range from $160 to $900. The question then becomes: how do I make a smart purchase and what do I get for my money at the various price points? For a basic understanding of how linen sheeting is made I recommend taking a few minutes to watch this video sponsored by a Belgian linen manufacturers association. Linen is big business in Europe and it’s no surprise they want to export to the American market. Here is the bias I bring to this post. I currently own two sets of queen-size linen sheets. By “set” I mean one flat top sheet, a fitted bottom sheet and a pair of side-opening pillowcases. I don’t buy linens à la carte as I feel sets provide better value. Most retailers sell sets though a few do not. Linen sheets have a substantially heavier feel than cotton. I have found them dryer, though not cooler or warmer as coolness or warmth comes from a blanket or quilt. I like the dryness. Not having a fitted bottom sheet is a non-starter for me. I also don’t buy strong or dark colors though I understand why others do. Ivory works best in my bedroom and it falls among the white-ivory-gray-natural spectrum of neutrals many retailers offer. Colored linen sheets are gorgeous and, though harder to find, can be good buys when they go on sale. Linen is made from fiber taken from flax-plant stalks. Flax, a food and fiber plant has blue flowers. 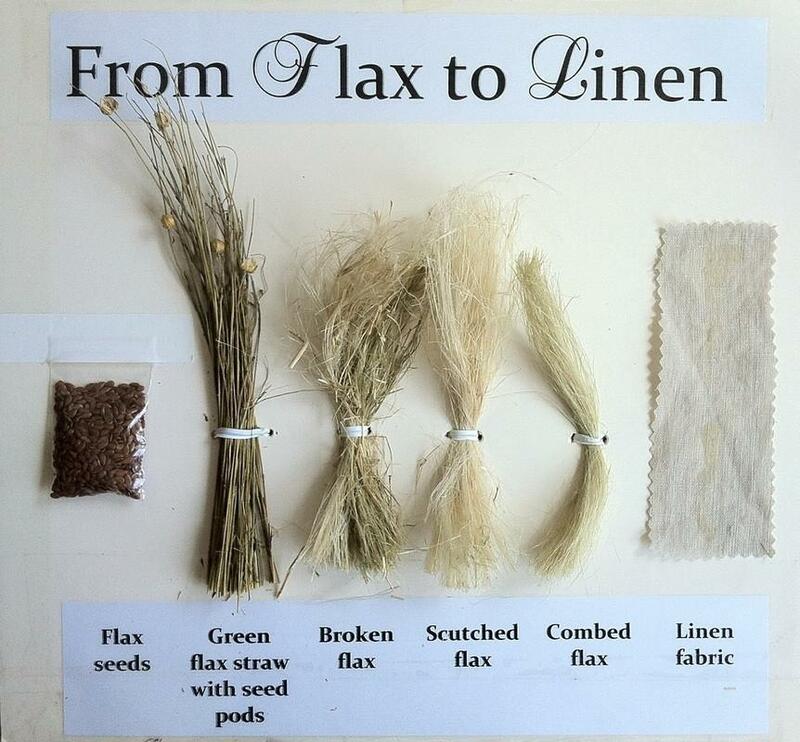 Cultivation of flax, and fabrication of linen textiles, is centered in Europe, most prominently in Belgium, France, Holland, Ireland, Italy, Portugal, Poland and Lithuania. Belgian linen, promoted as the standard for quality, is supported and trademarked by European trade associations. However, flax does not have a set of objective uniform standards to determine quality. But I found trademarked Belgian linen mentioned by only one retailer, Australian-based Pure Linen. So it’s practical to consider the term “Belgian linen” to be like “Egyptian cotton.” The flax may be grown in Belgium but processed elsewhere. As with Egyptian cotton there is no guarantee and no labeling standards by U.S. law. Some retailers do provide countries of origin which I endorse. I always check for the origin of the flax as well as the country of manufacture, which may not be the same. I also favor (perhaps unfairly) Europe over China. In my post on cotton bed sheets I explain how the marketing of sheets by thread count is no assurance of quality. With linen, thread count is meaningless. Let me repeat that: meaningless. Linen is marketed by grams per square meter. And good quality sheets are generally made from medium weight linen which one retailer — linenshed.com — defined as 6.50 ounces or 185 grams per square meter. (A meter is 39 inches, 3 inches longer or 9 square inches greater than a square yard). That’s why I’m always wary when I see linen sheeting described as airy or lightweight. I favor retailers, like Linoto, that clearly state the gram weight of their linen sheeting and the country of origin and fabrication as assurances of quality. The texture of linen is naturally slightly pebbly. This can be disconcerting at first, particularly with pillowcases. In my experience it takes a year of washing every other week for un-manipulated linen sheeting to begin to soften. That’s approximately 25 washes. However, some linen sheets are manipulated by physical or chemical means to soften and smooth it — or make it feel more like cotton. Treated linen sheets are marketed as “washed,” [like the Eileen Fisher sheets, above] “vintage washed,” “stone washed,” and more. Some consumers prefer the softer linen texture. The question, for me, is how, and whether, these softening processes affect the durability and life of the sheets. When you see complaints in reviews it’s good to keep this in mind. Basic colors are white, ivory, gray and natural. Retailers like Linoto and Matteo offer a wide range of color choices. Coloring or dying linen is another process. The quality of the sewing also can vary according to where and how sheets are manufactured. A boutique retailer like Linoto offers beautifully finished sides and hems. Hem sizes and styles vary. Some top-sheet hems are as generous as 6-inches deep, which gives a luxurious look to any bed. Standard top sheet hems range from 3-inches deep to 1/4-inch with a more industrial (or modern) style finish. Hems also can include picot or hemstitching details and retailers like Land’s End and L.L. Bean offer monogramming. One range of Cuddledown sheets has pretty tiered hems and Eileen Fisher linen sheets from Garnet Hill have picot plus raw-edge hems. Linen bed sheets are touted as investments in the $300-$500 range. However, there are cotton sheets at the same price point. And while linen is marketed as a purchase that will last for a lifetime, the useful life of any sheet set will depend on the quality of the textile and its fabrication, frequency of use, and washing and drying practices by the owners. I disagree with sources that use commercial laundry detergents such as Biz or Tide for washing linen sheets. I find these needlessly harsh for sheets that should last a lifetime. I don’t launder my cotton sheets with commercial detergents either. 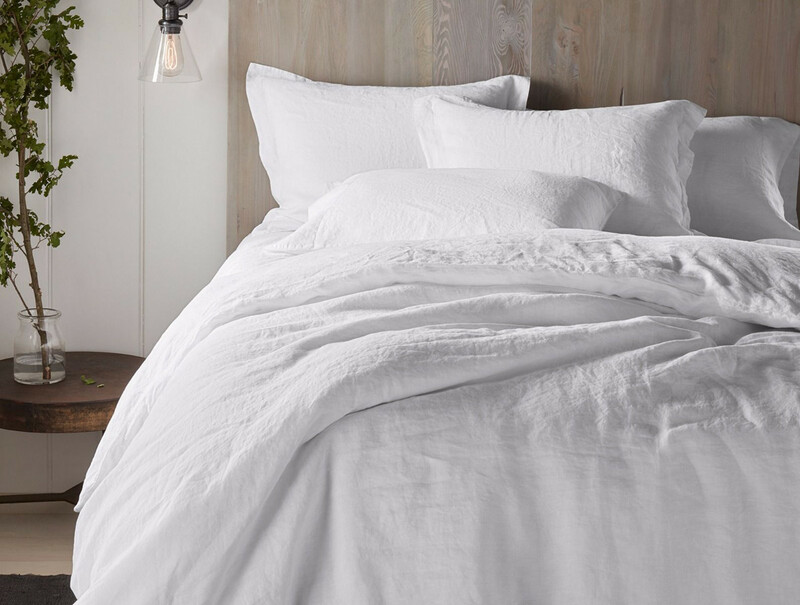 I use 2 tablespoons of Le Blanc linen wash, a premium fabric care product, for my bed linens. While that is an expensive product it lasts a long time because I don’t use it for any other purpose. Linoto recommends Ecos liquid to pre-wash their linen sheets and this is a less expensive alternative that I’ve also tried. It gives good results. For white linen sheets, a Grab Green pod and a hot water wash — between 125 and 140 degrees F — should be sufficient to keep them bright and white. Allergen cycles on many machines are optimal. What no one mentions — but I have found — is that the linen sheeting with a natural pebbly texture can act like a minor skin exfoliation during the night. 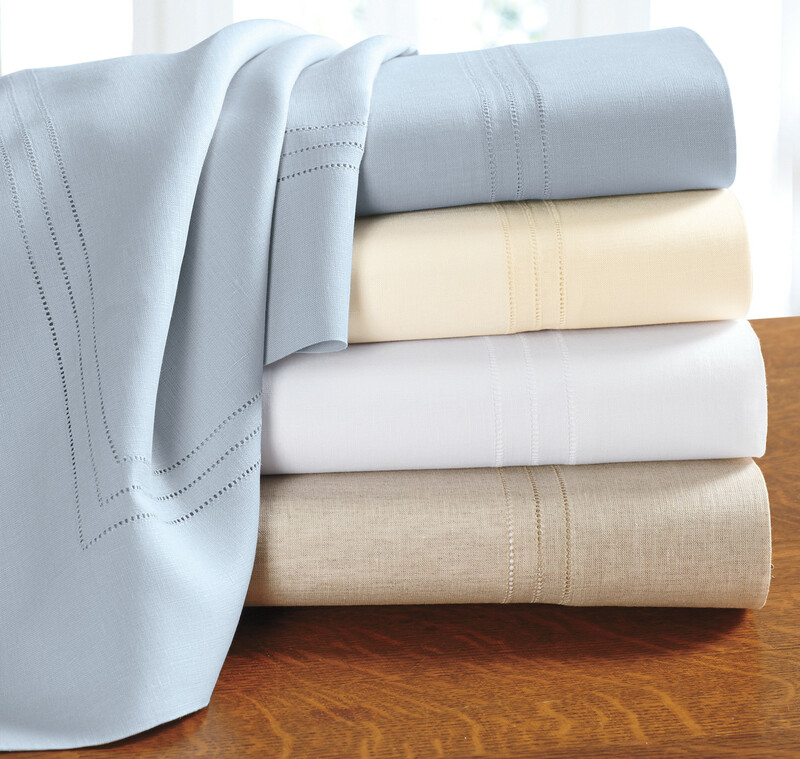 So to get linen sheets really clean you want to wash them in very warm to hot water — 125F to 140F. I do not wash linen sheets in cold water. Even darker colors can be washed in warm with a detergent like Perwoll Black that will help keep them colorfast. Even medium-weight linen sheets dry rather quickly. 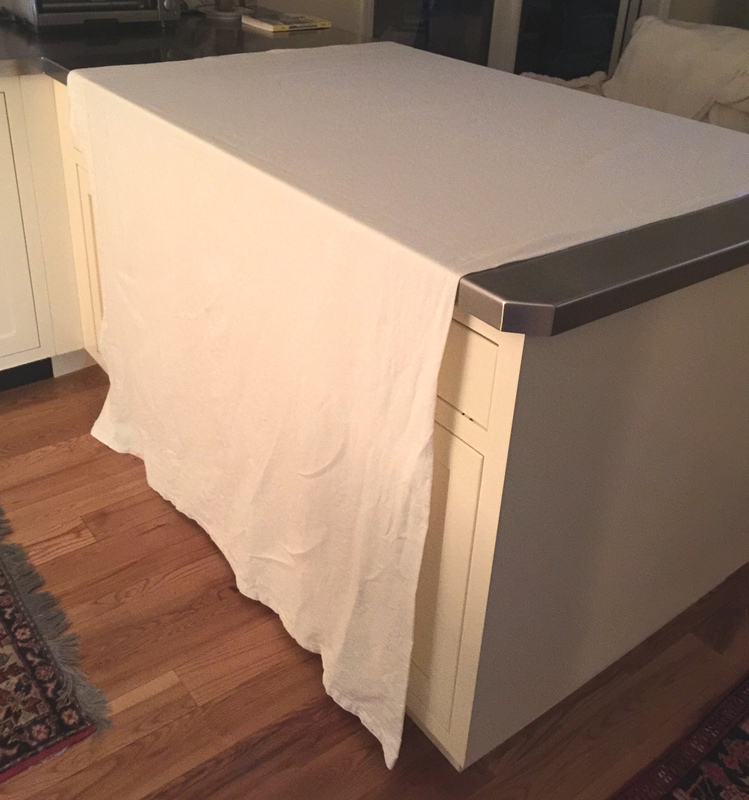 Air drying linen [on my kitchen counter, above] brings out the natural stiffness in about 2 hours. Space permitting, it will produce sheets with very little wrinkling that can be folded or put directly on the bed. After one night’s use they will soften considerably. If a softer texture is preferred, sheets can be par-dried in the dryer for 30 minutes on low, then removed and left to finish air drying. Alternately, they can stay in the dryer on a low setting until completely dry. One benefit of linen sheets is that they do not require ironing. However, steam ironing damp or dry sheets produces a wonderfully smooth — but not stiff — texture. That steam-ironed texture only lasts one night, however. I’ve currently paired down my linen closet to 4 sets of sheets. I have two sets of Sferra cotton percale sheets and 2 sets of Linoto’s natural linen sheets. I alternate them from week to week because I love the feel that each one provides. In the end, I believe you must get what you love. Here is an alphabetical list of are retailers I have bookmarked in my travels through “bed linen world,” along with a few notes that may be of help to browsers and buyers alike. Stonewashed Belgian flax. Woven in Portugal. No details on hem size. White only. UK retailer with white and color sheets. No info on fabrication, weight or origin. Comfort Wash Solid Linen bedding. Look like these are being discontinued. On sale. European flax. Prewashed Belgian flax sheets. No weight or country of manufacture. Stone-washed European linen sheets in 4 colors. Pretty riple pleated hems. Oeko-Tex certified. Made in Portugual. Also Italian Linen Sheets, with plain-sewn or triple hemstich hems. 4 colors. Made in Italy. European flax and prewashed. Linen weight is 165 gsm. 15 colors. Comes with linen storage bag. Oeko-Tek certified organic Belgian flax. Stonewashed. 165 gsm linen, milled in France. 8 colors. Blog entry has interesting background information. Belgian flax. 125 gsm weight. Enzyme washed. One year repair-replace guarantee. Monogram available. 100 linen bedding, Oeko-tex fabric. Handmade stonewashed Belgian linen (smooth, without the slubs and imperfections). Made in USA in Bogota NJ. Also show fitted sheet as “vintage washed.” There are numerous additional Etsy sellers. 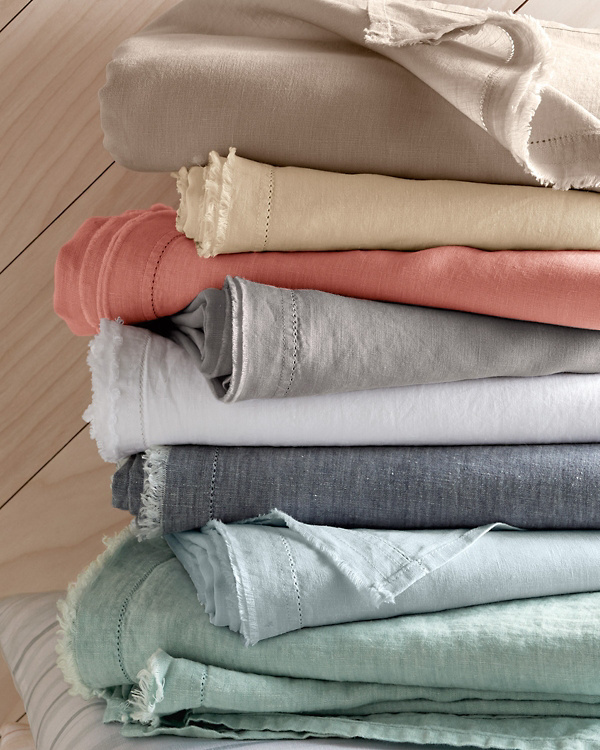 Sunwashed Linen Sheet Collection. European flax. Made in Portugal. Picot detail on flat sheet & pillow cases and smooth hems. 3 colors. Verano Hemstitch sheets. Made in USA, French flax, woven in Italy. White only. With hemstitch detail. 140 gsm. Vintage linen. Claims “28 single-metric yarn in both the warp and the weft.” Special washing treatment. About 18 colors. Sheets finished with minimal 1/4-inch hem. Belgian flax. Imported. Fitted sheet fits up to 18”. Can be monogrammed. OEKO-Tex certification. “Garment Washed” linen but no details. One comment says they are made in China. No flat sheets. Duvets only. Flax from Italy, Belgium, France and Ireland. Made in USA. Essentially custom. Gram weight and country of per square meter is given for each color choice. Weights range from 190 to 210. These are medium weight. 5 colors. No top sheet! Set consists of fitted sheet and 2 pillowcases. Some sizes sold out. Belgian flax, constructed in China. pre-washed and pre-shrunk. Australian retailer that labels their bedding according to various certification for European producers. Belgian and Lithuanian linen. Products custom made in Australia. Their stonewashed linen, it is made in Belgium under the Masters of Linen Certification, which is a guarantee that the European flax is grown and processed in accord with strict environmental and labour standards. Stonewashed linen, 10 colors. Says Belgian linen & Belgian flax. No country of manufacture. Orkney sheets are woven from European flax and made in USA. Bottom sheets are flat only. 3 colors. Generous 5” hem. Classico line is made in Italy. Flat sheet has 4-inch hem with hemstitching. This set is top of the line. Linen woven from Belgian flax, constructed in China. 3 colors. (Wirecutter & Apartment Therapy rated these highly). Monogramming available. This article is super super helpful thank you! ANy further updated tips on quality linen sheets would be welcome. I am looking to purchase a couple queen sets for next year. No rush…want to find the best sheets at best price. Really nice tour de horizon of linen sheeting–thank you! I have been happy with my Linoto sheets and use Rough Linen for top sheets in warmer weather, as they are lighter weight than the Linoto, which you term ‘medium weight’. I didn’t see any of the vendors as selling “heavy” weight sheeting. Are there any that you found? Appreciate your research!